Waco-McLennan County Health District nurse Regina Smith prepares to give a vaccine in 2014. The number of measles cases for the year rose to 7 in Texas and 80 nationwide as Bell County confirmed a case Wednesday, leading Central Texas medical experts to renew the call for vaccinations against the highly contagious virus. A child too young to be vaccinated was confirmed to be the first person to get measles in Bell County in at least the past decade, Bell County Health District Director Amanda Robison said. All members of the child’s family were up to date on vaccinations. McLennan County students with nonmedical exemptions to school vaccination requirements still represent less than 1 percent of the county’s student population, but their numbers have grown in recent years, according to state records. The 80 U.S. cases of measles are across 10 states: California, Colorado, Connecticut, Georgia, Illinois, New Jersey, New York, Oregon, Texas, and Washington, according to the Centers for Disease Control and Prevention. The 80 cases confirmed in the first 36 days of this year amount to 21.5 percent of the 372 cases reported in all of last year. Two things can prompt an increase in measles cases: international travelers bringing it to the U.S., and an increase in unvaccinated people, according to the CDC. Measles outbreaks tend to happen in pockets of populations where people are not vaccinated, said Dr. Manjusha Gaglani, chief of pediatric infectious diseases at Baylor Scott & White McLane Children’s Medical Center in Temple. Measles is one of the most contagious infections and can lead to secondary bacterial infections, pneumonia, brain damage and extended hospital stays, she said. There has not been a case of measles reported in McLennan County in at least a decade. The Bell County child was not school age, but all Texas school districts require standard immunizations, including against measles. Exemptions vary from state to state, but almost all states grant exemptions for vaccine requirements for people who have religious objections to immunizations, according to the National Conference of State Legislatures. Texas is one of 17 states that allows philosophical exemptions for people who object to immunizations because of personal, moral or other beliefs, according to the organization. 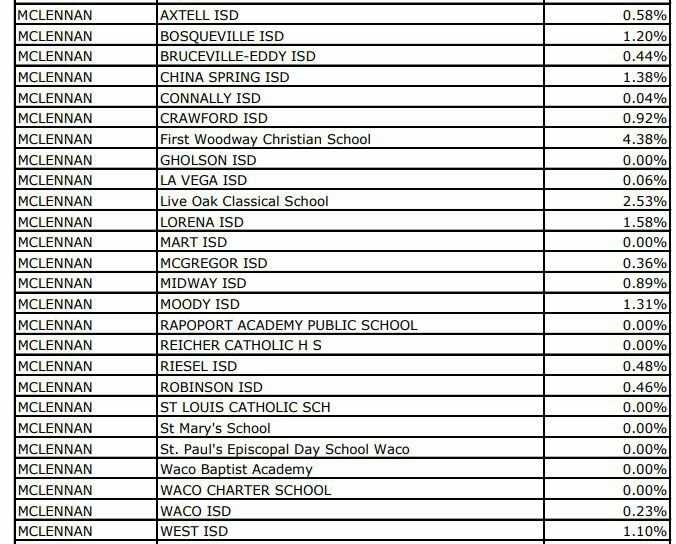 Out of Waco ISD’s about 15,000 students, 37 have philosophical exemptions to vaccine requirements, and 11 have medical exemptions, spokesman Kyle DeBeer said. Another 13 without any exemption are not up to date on the combined vaccine for measles, mumps and rubella, but nine of the 13 enrolled recently and have not yet submitted all records, DeBeer said. Countywide, 0.56 percent of the students last school year filed a philosophical exemption, up from 0.27 percent during the 2011-12 school year, according to the Texas Department of State Health Services. First Woodway Christian School had the highest percentage of students with nonmedical exemptions in the county last school year, at 4.38 percent, followed by Live Oak Classical School with 2.53 percent and Lorena ISD with 1.58 percent, according to the health department. In Bell County, 0.37 percent of students filed the exemption during the 2011-12 school year compared to 0.91 percent last school year, according to the health department. Measles spreads through the air when an infected person coughs or sneezes, and it can be contracted by being in a room two hours after an infected person has left, according to the CDC. Symptoms start with a fever, then a cough, runny nose and red eyes. Then a rash of tiny red spots breaks out, starting at the head and then moving across the body. The way to protect someone from measles is getting the vaccination, said Kelly Craine, spokeswoman for the Waco-McLennan County Public Health District. “This is a vaccine preventable disease,” Craine said. Unvaccinated children are themselves at risk and also put others at risk, including children who are unable to get vaccinated for medical reasons or who face other medical complications, she said. “Not only are their kids at risk but they are putting people who have cancer and chemotherapy or other immunization compromised infections at risk,” she said. Waco resident Stefanie Wheat-Johnson said she is all too familiar with managing risks for a child with a weakened immune system. Her son, Ever, was diagnosed with acute lymphocytic leukemia when he was 3 years old. A year and a half into treatment, Ever is doing well, and is considered “low risk,” but precautions are needed because of his weak immune system, Wheat-Johnson said. “You don’t have the natural abilities in your body to fight something like the measles like a normal child might have,” she said. “For us, any time the flu goes around or any sort of, especially things that might complicate and turn into infection, we suddenly have to amp up our protocols and how to handle daily life. Wheat-Johnson said learning of the measles case so close to McLennan County raised additional alarms. She said on some level she understands people who do not get vaccinations, because everyone should be careful and vigilant about what they put in their bodies. However, her family has learned a lot since Ever was diagnosed with cancer. If someone does not trust their doctor enough to follow advise on vaccinations, they should get a new doctor, she said. Gaglani said anyone unsure if they are up to date on vaccinations should speak to their doctor. Anyone who believes their child may have contracted the measles should call a hospital before arriving to give them a heads up, she said. The hospital will prepare special rooms with airborne isolation to prevent anyone with measles sitting in a waiting room, she said. “That helps a lot in caring for them and not spreading it,” Gaglani said.